Not to be confused with risoni. For the album by British electronica group Fluke, see Risotto (album). Risotto /rᵻˈzɒtɒ/ (Italian: [riˈzɔtto] or [riˈsɔtto]) is a northern Italian rice dish cooked in a broth to a creamy consistency. The broth can be derived from meat, fish, or vegetables. 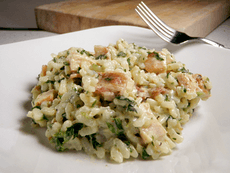 Many types of risotto contain butter, wine, and onion. It is one of the most common ways of cooking rice in Italy. Risotto in Italy is normally a primo (first course), served on its own before the main course, but risotto alla milanese, (pronounced [riˈzɔtto alla milaˈneːze]), is often served together with ossobuco alla milanese. A high-starch (amylopectin), low-amylose round medium- or short- grain white rice is usually used for making risotto. Such rices have the ability to absorb liquids and to release starch and so they are stickier than the long grain varieties. The principal varieties used in Italy are Arborio, Baldo, Carnaroli, Maratelli, Padano, Roma, and Vialone Nano. Carnaroli, Maratelli (historical Italian variety) and Vialone Nano are considered to be the best (and most expensive) varieties, with different users preferring one over another. They have slightly different properties. For example, Carnaroli is less likely than Vialone Nano to get overcooked, but the latter, being smaller, cooks faster and absorbs condiments better. Other varieties like Roma, Baldo, Ribe and Originario may be used but will not have the creaminess of the traditional dish. These varieties are considered better for soups and other non-risotto rice dishes and for making sweet rice desserts. Rice designations of Superfino, Semifino and Fino refer to the size and shape (specifically the length and the narrowness) of the grains, and not the quality. There are many different risotto recipes with different ingredients, but they are all based on rice of an appropriate variety, cooked in a standard procedure. The rice is first cooked briefly in a soffritto of onion and butter or olive oil, to coat each grain in a film of fat, called tostatura; white or red wine is added and must be absorbed by the grains. 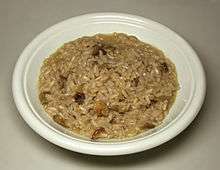 When it has evaporated, then the heat is raised to medium high, and very hot stock is gradually added in small amounts, while the concoction is stirred gently, almost constantly: stirring loosens the starch molecules from the outside of the rice grains into the surrounding liquid, creating a smooth creamy-textured liquid. At that point, the pot is taken off the heat for the mantecatura (the point when diced cold butter is vigorously stirred in), to make the texture as creamy and smooth as possible. It may be removed from the heat a few minutes earlier and left to cook with its residual heat. Properly cooked risotto is rich and creamy, but has some resistance or bite (al dente) and separate grains. The traditional texture is fairly fluid, or all'onda ("wavy, or flowing in waves"). It is served on flat dishes and should easily spread out but not have excess watery liquid around the perimeter. It must be eaten at once, as it continues to cook in its own heat and can become too dry with the grains too soft. Risi e Bisi A Veneto spring dish that is correctly served with a spoon, not a fork; it is a soup so thick it looks like a risotto. It is made with green peas using the stock from the fresh young pods, flavored with pancetta. ↑ Green, Aliza (2006). Starting with Ingredients. Running Press. p. 810. ISBN 978-0-7624-2747-5. ↑ Eleonora Baldwin. "Aglio, Olio e Peperoncino". aglioolioepeperoncino.com. Retrieved 29 August 2015. Look up Risotto in Wiktionary, the free dictionary.